Initially the balance point will be at J1 as indicated in the figure. 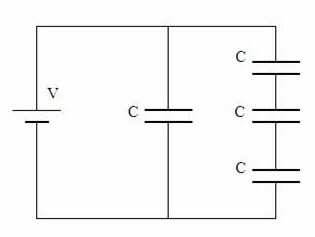 On interchanging the resistances the balance point will shift to J2 so that the length of the bridge wire between J1 and J2 is 20 cm. The balance points J1 and J2 must be equidistant from the mid point (50 cm mark) of the wire so that J1 is at 60 cm and J2 is at 40 cm. This gives L = 40 cm. When a 2 Ω resistance is connected in series with the 4 Ω resistance in the leftt gap, the balancing length becomes 50 cm (since the gaps contain equal resistances). Therefore the shift in the balance point is (50 cm – 40 cm) = 10 cm. (1) An initially uncharged capacitor of capacitance 100 μF is charged at a steady rate of 20 μC/s. What is the time (in seconds) required for the potential difference across the capacitor to build up to 12 V? (2) A battery of emf V volt is connected to a combination of four identical capacitors (each of capacitance C farad) arranged as shown in the adjoining figure. What is the amount of energy supplied by the battery to the capacitor combination? (3) A parallel plate capacitor with air as dielectric has capacitance C. It is charged fully using a battery of emf V. The battery is then disconnected and the separation between the plates of the capacitor is doubled. What is the final energy stored in the capacitor? When the separation between the plates is doubled, the capacitance is halved (C/2). [Note that the capacitance of a parallel plate air capacitor is given by C = ε0A/d where A is the plate area and d is the separation between the plates. E = C2V2/(2C/2) = CV2, as given in option (b).